as of right now i am game for this. i have an idea to make the drive even more exciting and to help keep everybody in the cars alive. they have a walkie talkie app called zello, me and my tow truck buddy's from all over use it to stay in contact and its a great time. also would help incase somebody needs to pull off for a bathroom, gas, or is having a car failure. I'll get you added to the list! Glad to see a new face too, I've been putting these cruises on for nearly a decade and they are a blast! Some of us do actually use walkies, Tom (supraboy1) has 6 or so high-powered ones and they worked very well. We tried that app once on a cruise down near Austin, TX a few years ago and it was really tough to hear, but maybe they've made some voice quality improvements since then, thanks for the suggestion. Last edited by Kracka; 10-23-2015 at 02:18 PM.. I'm going to plan on going + cheeze (nacho). Awesome, I'll get you both added! Okay, last year I had a concert booked on the spring cruise dates and a couple leaking injectors on the FD. So, this time it's planned so far in advance I can make it happen! I have spent the last 3 months rebuilding the fuel system on the FD from a new Supra fuel pump, FFE rails and injector dynamics injectors along with new braided nylon lines. So it will be ready! The Evo has been great, needless to say. Now, do I go solo, with the wife or a friend, take the FD or the Evo. choices.Thanks for planning so far in advance. Awesome another fd owner. Sounds like you did the fuel system right. Sounds interesting, will see if I still have the benz by then or something else to drive. Thanks for planning so far in advance. Of course, glad it worked out in a way that allows you to join! If anyone is traveling from a distance and needs a hotel room for Friday night as well let me know and I'll post the info for where those of us caravaning up are staying! Hey! good to hear another FD owner is on here! I did it right, but it took awhile as I was a cheapskate and ordered all my fittings and lines from China. Then actually planning the fuel system, installing ti all, getting the leaks right took some time. I have a Good friend named Chris Schutt in Hastings that helped me the whole way through. It's running now and I am just working out the tune with Adaptronic support. Got it running well but the idle is crap. Bump for the new year, only 4 months away at this point! Get your rooms booked and stop slacking on your winter repairs/builds! Room prices have dropped since I booked so now is the time to do it. Last edited by Kracka; 01-13-2016 at 09:26 AM.. Damn cruise time is taking forever! 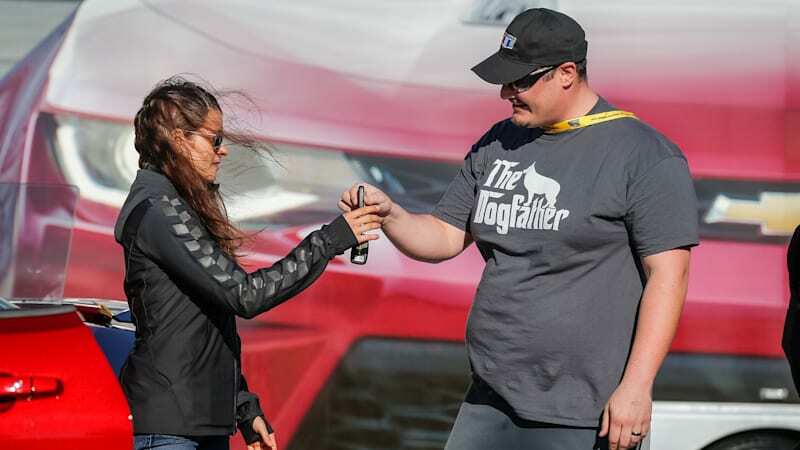 That's him getting the keys to his 2016 Camaro SS from Danica Patrick. Last edited by Kracka; 01-27-2016 at 08:23 AM..
haha thats cool, where did he get that?